What does it mean to shove in poker? It simply means you move all-in, putting either all your chips or money on the line. For example, if you hold A♦A♠, you’d be looking for a good spot to shove and, hopefully, double up. In a tournament report, it may be written something like: 888poker Ambassador Dominik Nitsche shoved for 1.4 million and 2014 World Series of Poker Main Event champ Martin Jacobson thought for a bit before folding. Shoving all-in is a powerful move, and it’ll win you the pot a lot of the time. So, why not shove every hand? Well, as the saying goes: “It works every time until the last time.” That means eventually someone will look you up and, if you lose, you’re out. The more you shove, the less likely your opponents will believe you have a quality hand. Do it too much, and they’ll be prone to call you with weaker hands. Think of a shove as the biggest weapon in your poker arsenal. It can do a lot of damage, but you want to deploy it at the right time. If you wield the weapon too liberally, your opponents will be neither scared nor deterred. In any given poker game, you can shove for several reasons. It may be to try and double up, or maybe to put your opponent to the test. Most players end up shoving when they become short stacked, say on stacks of 10 big blinds or under. They don’t have enough chips to make many moves, so often it’s either move all-in or fold. For instance, if you have 10,000 with the blinds at 500/1,000/100 and look down at the A♦Q♠, chances are you’re going to shove. For players with big stacks, the opposite is true. They may shove to put the pressure on smaller stacks, who would be the ones putting their tournament life on the line. Imagine there’s 40,000 in the pot, and you’re sitting with the 10♥9♥ on a 10♦J♣2♥5♦ board. You have 35,000 back and your opponent, who is sitting with 150,000, moves all-in. His shove puts you in a tight spot. Knowing when to move all-in is the best way to effectively use your stack, especially if you can pick up blinds and antes without opposition. By shoving you also avoid losing chips unnecessarily by limping and raising, only to fold on a later street. For instance, if you raise with the A♥10♣ and the player in the big blind calls, what will you do when the flop comes down 5♣6♦7♠ and your opponent bets? Had you just shoved preflop there’s a good chance you would have won the blinds and antes, but now you are going to lose valuable chips. The best opportunities to shove are often in position. The later you act, the better chance you have of getting a shove through. That’s because there are fewer players to act behind you. 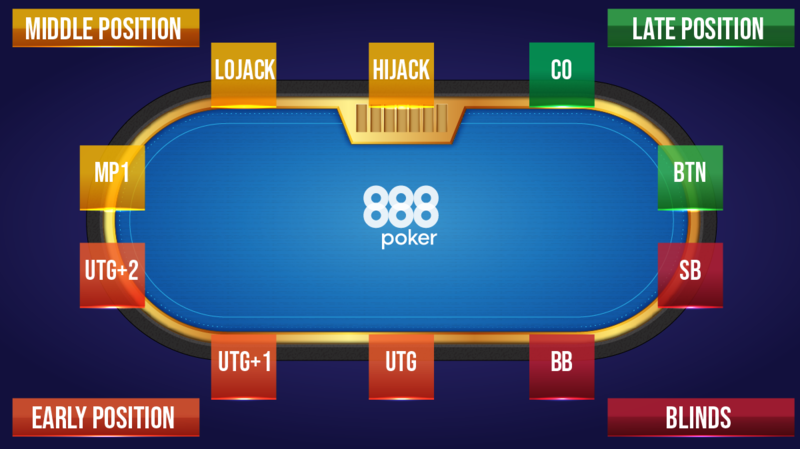 If you’re under the gun at a nine-handed table, eight other players will act behind you if you push, (more chances for someone to wake up with a big hand). If you’re on the button and shove, just the two players in the blinds are left to act (only have to dodge two chances for players to wake up with a big hand). Shoving from early position (UTG, UTG+1 & UTG+2) runs more risk than doing it from middle position (MP1, lojack & hijack). Shoving from late position (the cutoff or button) is your best bet. Shoving opportunities from either the small or big blind are scant, as you’re last to act. Chances are someone has already either entered the pot or moved all-in, which takes away some of your options. You don’t need a made hand to move all your chips into the middle. If you have the gusto, you can shove with complete air. Poker bluffing, which is the act of making your opponent believe you have a better hand than you really do, is a big part of poker and shoving is an effective tool in pulling it off. Shoving as a semi-bluff – meaning you don’t have a made hand but have strong potential to improve – is especially successful. Ideally, your opponent folds, and you take down the pot, but even if they call, you could still improve to win. An excellent example of a semi-bluff might be 888poker Ambassador Chris Moorman shoving on a 4♥5♥6♠ flop holding the A♥7♥. He doesn’t have a made hand, but with both an open-ended straight and flush draw, he has a strong possibility of making the best hand on either the turn or river. If you have either the nuts or a hand you figure to be best, you may want to consider shoving for value, also known as a value shove. It’s an overbet to the pot, most often by pushing all-in. For example, let’s say you have the 7♣6♣ on a 5♣K♠8♣9♣K♦ board and the action has been fast between you and two opponents. There’s a good chance one or both of your opponents, who we’ll assume have bigger stacks, have strong hands like an ace-high flush, a full house, or even quads. If there’s 300,000 in the pot and you’re sitting with 450,000, you may want to consider a value shove. If your opponents have something, they’ll likely pay off your straight flush. There’s also a delayed value shove, which means waiting to shove until your opponent catches up. A good example would be holding the 7♦7♠ and having the flop come down 7♥3♥3♣ to give you a full house. If you shove all-in, you’ll more than likely scare off your opponents and not get paid. Instead, play it slow and give them a chance to make a good hand. WHAT IS AN OPEN SHOVE? An open shove is simply moving all-in as the first player to either enter the pot or act on the flop. You are opening the action by shoving, as opposed to a smaller raise. A re-shove is pushing all-in over the top of a player who has already shoved. For example, with the blinds at 200/400/50 Moorman shoves for 4,000 from the cutoff and Jacobson re-shoves for 12,000 from the button. A lot of the time, a re-shove is done to isolate an opponent. In the above example, if Jacobson just calls he might invite others into the pot. If he wanted to get Moorman one-on-one, re-shoving is a way to discourage other players from entering the pot. A re-shove usually indicates strong holdings. That’s because it’s assumed the first player has a good hand, or at least decent enough to move all-in first. By shoving over the top, the re-shover is saying that he has a very strong hand, one that he’s not afraid of taking into battle against the initial shover. WHAT IS A BACK SHOVE? Let’s say 888poker Ambassador Sofia Lövgren (240,000) raises to 25,000 under the gun with the K♥J♥, and Parker “Tonkaaaa” Talbot (500,000) picks up the A♣A♦ in the hijack. He may call in the hope that a short-stacked player shoves all-in behind. He’s limping with the intention of moving all-in if the action reopens. Let’s imagine the player in the small blind does push all-in for 50,000 and Lövgren calls. Now Talbot can execute the back shove by moving all-in himself. The back shove is hard to execute but usually results in winning a big pot. If you see another player back shove, be careful, as it’s usually an indicator of a monster hand. The bubble is the point in the tournament where one or more players must exit before the remaining field is in the money. If you’re going to shove on the bubble, you should have a good reason for doing so. That’s because if you push and lose you will be the bubble boy, meaning you will leave empty-handed. Most short stacks avoid shoving on the bubble without a super-strong hand. That’s because they know they’re likely to get called by an opponent hoping to burst the bubble. There is a considerable equity difference between bubbling and making the money, so if you’re going to take a risk by shoving, do it with a hand that is likely to give you a significant edge. Pay attention to stack sizes before shoving. You’re more likely to get called when you shove into players with big stacks. On the flip side, shoving into short-stacked players is more likely to elicit folds. Also, be aware of your image at the table. If you play a lot of hands and shove a lot, your opponents will be less inclined to give you credit. They won’t respect your shove and may call light. However, if you have a tight image and they think you only play strong hands, they’ll be reluctant to call. You should be willing to capitalise on your tight image, which means shoving with weaker hands. Your opponents will still give you credit for a monster, and you’ll be able to win some much-needed chips. Also known as a Push Fold Chart, a Poker Shove Chart helps short-stacked players determine when they should shove and when they should fold in any given hand of poker. A generic chart will lay out a wide range of hands, but more in-depth charts and apps (such as Max Silver’s SnapShove) break it down even further by taking factors like number of players at the table, position etc. into consideration. 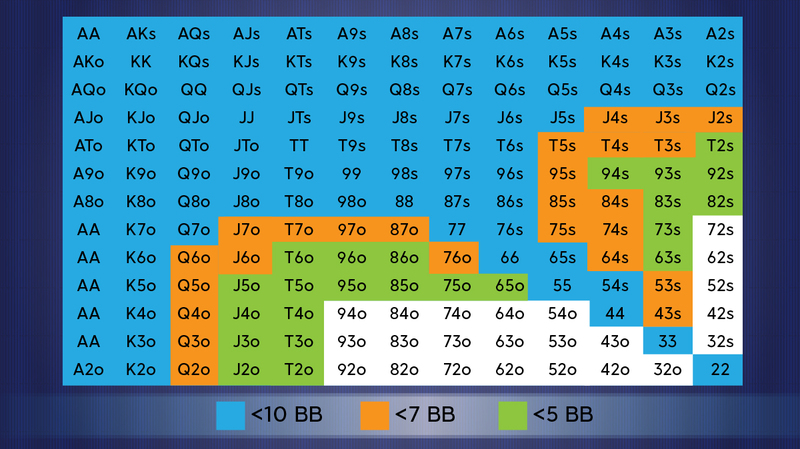 Here’s a handy Poker Shove Chart for when you’re sitting with less than a 10-big-blind stack.